Only a few Christians today have heard of T. Austin-Sparks (1888-1971), who was a minister of Christ in England. However, his writings were of great help to Watchman Nee, especially in the matters of the resurrection of Christ and the Body of Christ. Watchman Nee translated the works of several Christian authors into Chinese, but the one whose works he translated the most were those of this author. Very little is known about the life of T. Austin-Sparks. 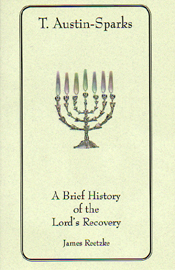 This volume uses some of his published recollections and other material to give the reader a glimpse of his life and ministry.